A day tour to Kom Ombo Temple, which stands on a high ground overlooking the River Nile. 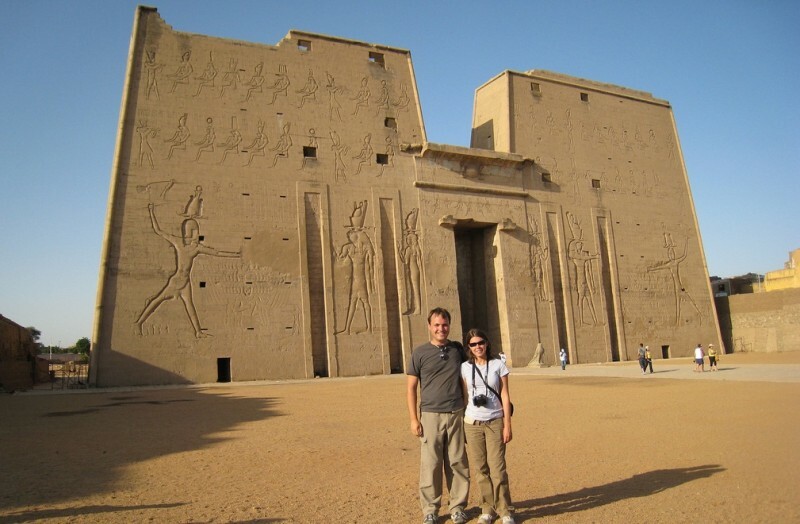 Then onto Edfu Temple which is dedicated to god Horus and it considered the best preserved cult temple in Egypt. Egypt Travel representative will pick you up from your hotel in Aswan to enjoy a day tour to the Temple of Kom Ombo standing on high grounds overlooking the Nile. It differs from other temples because of its double entrance, each one is dedicated to divinity: "Haroeris" with his falcon head and " Sobek " with his crocodile head. The Temple of Kom Ombo was built on the honor of two deities the crocodile-headed Sobek, god of fertility and creator of the world, and Haroeris or the ancient falcon-headed Horus. Also, Kom Ombo's importance lies in its huge sugar-cane. Lunch at local restaurant, then cross the Nile to Edfu where you will be transferred by a horse carriage to visit the majestic temple dedicated to Horus which is considered by most to be the best preserved cult temple in Egypt. According to the Egyptian myths, it was the place where the falcon-headed god Horus revenged the murder of his father Osiris by killing Seth.